Reflections of a Newsosaur: How long can print newspapers last? 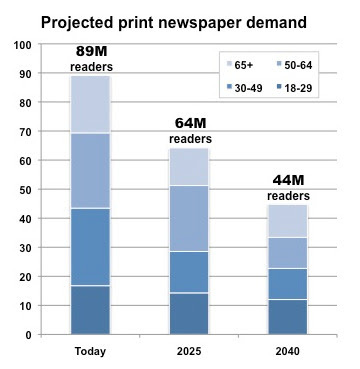 Actuarially speaking, the population of print newspaper readers will drop by nearly a third within 15 years and probably be less than half the size it is today by the time 2040 rolls around. The inevitable – and seemingly irreversible – contraction of the newspaper-reading audience begins to answer one of the most frequently asked questions I hear: How long can print newspapers last? Print matters, of course, because it is responsible for generating 95% of the revenues for the typical newspaper company. Stop printing papers and most companies at best will be left with a skeleton-staffed website subsisting on 5% to 10% of the advertising dollars the business formerly produced. The future of print will depend on three major variables: Consumer demand, the health of the economy and the future appetite among marketers for newspaper advertising. We will explore the outlook for consumer demand today and look into the other two questions in the next installment of this series. From the available data, we know with a reasonable degree of certainty that half of the newspaper readers today are 50 years of age or older, even though this age group represents only 30% of the total population. We can conclude from the demographic distribution of the newspaper audience that individuals under the age of 50 are far less likely to read newspapers than their elders. And we know everyone eventually will die, with the oldest readers statistically likely to expire sooner than the younger ones. Unless something unforeseeable happens to change the news-consumption habits of younger readers, it stands to reason that the total audience of newspaper readers will shrink as the older generation dies off. If you project the future age distribution of newspaper readers, you can begin to get a sense of how long the print audience will be around. And that’s what I did by combining census data, actuarial tables and a recent study of media-consumption patterns from the Pew Research Center for People and the Press. :: Half of the today’s 50-plus readers would die off by 2025 and the other half by 2040. This projection is based on the most recent life-expectancy data published by the Social Security Administration, which predicted the average lifespan for a 50-year-old man is 78.5 years and the average span for a 50-year-old woman is 82.5 years. :: Owing to alternative venues and technologies for news consumption, I assumed newspaper readership would drop 15% per under-50 cohort by 2025 and 25% per under-50 age group by 2040. While these assumptions are by far the most arbitrary I made, they probably are too conservative. In other words, I would bet young readers will forsake papers faster than I say they will. After crunching the numbers, I found (as illustrated in the chart below) that newspaper consumption would drop by 27% from today’s level by 2025 and nearly 50% from today’s level by 2040. Here’s how that plays out: The question for publishers is how long their audience will be large enough to justify the enormous expense of owning and operating the massive and inefficient infrastructure they use to manufacture and distribute newspapers. Next: How long can publishers afford to print? This is actually quite an optimistic viewpoint when one considers we have been shedding circulation at a 4-5% clip the past few years. Many newspapers will jump for joy only to lose 1.5-2% a year for the next 15 years. With such a high percentage of our readers in the 60+ crowd, be not surprised if the same numbers continue as those readers change their place of residence to the graveyard, nursing homes and their eyesight becomes an issue. Perhaps you'll deal with it in your next installment, but your actuarial approach ignores another important factor: Readers over 50 who are simply giving up on the print newspaper because of cost, declining quality, time constraints or preference for online news. Anecdotally I know many people over 50--and even over 70--who used to be longtime newspaper readers but have stopped subscribing and/or switched online. That's going to greatly accelerate the audience decline that you (very conservatively) forecast. Another great post. One solution might be to try and attract younger readers, but the structure of newspapers seems to defy this -- from the emphasis on obits to the story choices of clueless editors. For example, how many papers played up the Jay Leno dispute when he appeals to older audiences, while downplaying or ignoring Simon Cowell's decision to leave American idol? American Idol gets an audience of 30 million, compared to less than 5 million for Leno. * Have younger newspaper readers been outnumbered by their elders all along? If so, by what margin, compared to today? * Has "local" news been consistently more important to younger newspaper readers all along. Or has that changed over time - as compared with their consumption of national and world news in print? A worthwhile analysis. And a conservative one because it assumes that everyone over 50 who is now reading a newspaper will continue to do so until he draws his last breath. The likely reality is that a percentage of those 50-plus will fall away because newspaper subscription prices will have to keep rising and alternatives to newspapers likely will increase. A second point: when you analyze the economics of newspapers' costly infrastructure, don't forget that the entire carrier distribution system hinges on having a reasonable density of households taking the paper. Once that reasonable density disappears, the economic basis of driving all over the place in the middle of the night collapses. Where does the figure of print generating 95% of revenues come from, Alan? When I left McClatchy, non-newspaper revenues were already well above 15% and quickly headed higher. I know from public data that its digital revenues have continued to grow. Is McClatchy that different than other companies in the 95% category? I'm sure you also know that newspapers are quickly shedding the ownership costs of print infrastructure. I believe about a third of the McClatchy papers are already printed on contract, and others are earning more revenue by printing other newspapers and products. I'm sure you will address this trend in part 2. Anonymous at 7:01 AM said... "For example, how many papers played up the Jay Leno dispute when he appeals to older audiences, while downplaying or ignoring Simon Cowell's decision to leave American idol? American Idol gets an audience of 30 million, compared to less than 5 million for Leno." Great point Anon. That's not just clueless. That's a deathwish. I occasionally wonder how newspapers managed to lose circulation during the last presidential election, with all its tremendous change in the political landscape. Willfully ignoring what's important to their readers would explain it. This analysis assumes, doesn't it, that once those now 50 and older die off, there aren't going to be any more 50+ folks. Obviously, that's not true - the bubble of seniors is going to get considerably larger in the next two decades. So, is there any evidence that those who forsake newspaper readership in younger years adopt the habit as they age? Or better yet, is there a way to take the obvious of age disparity and make it an advantage for newspapers? Is there an obvious opportunity before we throw out everything to focus on younger consumers? I think this is a great post and I look forward to seeing the next in the series. I am actually more optimistic about the news business today than in quite a while. Everyone assumes the future of the news is electronic distribution, but few papers are making enough money with their web sites to compensate for their print losses, right? But hard as it might be to find a winning formula online it might prove to be easier to find that magic formula than to find the formula that drives readers back to print (which may your conclusion, as well -- we'll see soon, I assume). Further, the move towards tablets and readers, and mobile media, in general, may provide the revenue models necessary to succeed online (at least we all hope it does). I'm going to line up with Mr. (or Ms.) 7:03am Anonymous. We need a set of charts like these from 1960 or so, when some of us were just starting out in the business. As I recall, we were beleaguered daily with studies showing that people in the treasured 18-to-34 age group hardly ever looked at a newspaper. I know I've been hearing it steadily for 50 years. How much would a 1960 bar graph differ from today's? 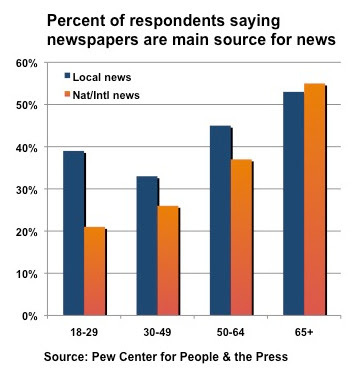 People get older, they find more things to like -- and trust -- about newspapers. Let's try taking advantage of this, instead of just dumbing down the papers to attract the bubble-gum crowd. 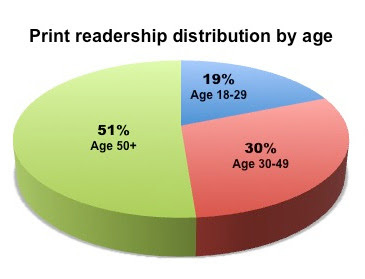 I remember, about five years ago, sitting in a presentation by our then "strategic resources" folks and they showed a graph of print subscribers by age. There was a marked drop-off in print subscribers at the under 35 year old mark. Then they showed a graph of web site subscribers by age and the graphs were almost the reverse, with a dramatic drop-off of web subscribers at the over 35 year old mark. The two graphs put together showed a stunning amount of stability across all age groups. The point is that readers aren't leaving... they're just changing media. If the news companies don't change with them, someone else will. This is interesting, but actuarial considerations are going to be overwhelmed by technology and the economics of newspaper journalism. Very few papers are going to last long enough to be around when their readers die. I'd be surprised if newspaper readership hasn't dropped 50 percent in 5 years. (That's a guess; no data.) How can anybody make any reasonable prediction about technology--which is what this is really about--30 years in the future? Won't we be driving flying cars by then and taking vacations on Mars? 1) All the variable input costs will increase over the next few years, labor, fuel, paper, etc. 2) All the revenue, advertising, spends far less on newspaper ads. 3) Retail commerce is moving online and away from traditional automotive and department store chains. And Wal-Mart barely advertises. 4) Newspaper websites stink, and they don't have the money to hire highly competent web designers that they desperately need. Newsroom managers are too ignorant to get out of the way even if they did have the best and brightest. 5) Young people won't ever read a newspaper, period. Magazines, maybe, but even they need to change drastically to compete with the variety of media. There's just too much other stuff out there. 6) Declining newspaper quality and increasing cost will drive more of the 50+ crowd away to alternatives, especially those middle-class readers with high-speed internet. 7) As higher-margin readers move away, advertisers will as well. I think most major metros will be gone in less than 10 years, maybe 5. That's probably good, too, because they're really lousy businesses. All based on the assumption, as the author admits, that we're not making new newspaper readers out of young people. That is wrong. Eighty-two percent of college students read their campus paper. The industry loses them after that. College newspapers are free and convenient to get and relevant to their core audience. If commercial newspapers would follow that model, they would retain younger readers who first get the habit in college. Good post. To your analysis that the future of print will depend on three major variables (consumer demand, the health of the economy and the future appetite among marketers for newspaper advertising), I'd add a fourth: the speed of innovation in the next generation of digital news products and their packaging and delivery. I suspect that before long (perhaps starting this month!) we'll begin to see some truly appealing devices that will lay the foundation for a richer and more immersive digital media experience. The sooner all that comes to pass the faster people will ditch print. Echoing previous commenters, the actuarial analysis just predicts the eventual demise of the currently existing print readership. But the viability of newspapers printed and delivered daily will cease long before that happens. You'll tell us your views tomorrow, but my prediction is: 10 years from today, there are fewer than 100 7-day newspapers left in the U.S.
What I think from people comments here it that this analysis assumes that everything stays as it is now. This is a fair assumption for a first run! We can go plus or minus on that. I think it is optimistic for printed newspapers. People do want the news, if newspapers drop, they will have to get it from the net. The web may be producing less revenue, but it is cheaper to produce and distribute. Older people are getting more experienced with computers. They need it to communicate with their children and grandchildren. As they get better, I am sure their uptake on the net will increase. Plus the old age homes are starting to improve their web capabilities. Newspaper are being dropped by resellers and delivery contractors as they become less profitable. Another consideration is how long will advertisers continue to support the daily newspaper. As media options multiply and household-specific direct marketing continue to evolve, advertisers will migrate to the most efficient channels. Newspapers continue to operate and market themselves as a mass medium while they continue to become a niche player. Advertisers will likely abandon them for more targeted and efficient channels. If, however, newspapers adopt a customer asset approach to audience management and provide competitive consumer marketing channels, especially online and mobile,they may be able to keep enough advertisers to sustain themselves. That said, its hard to imagine they can sustain a 7-day print operation for too much longer. Traditional newspaper management continue to whistle past the graveyard hoping it wont get too bad during their watch. Meanwhile the Disruptors will continue to erode their once dominant share. When the thief aggregators have to pay people to gather news, are able to increase their own revenue to pay for it and command anything close to the 100 million daily newspaper readers in this country, then I'll listen to them. The sky is falling!!! It's easy to potshot from the sidelines. All you prescient critics -- where is your business model? Who provides the vital information this country needs to remain free? Simon Cowell's future, spoonfed to an idiot generation, is as much of a threat to democracy as anything -- if that's all the idiots care about. I'm a Michigan-based weekly newspaper owner and a journalism professor with an interest in media economics and the future of print journalism. Having said that, do you have different views on weekly newspapers' future? Small daily newspaper's future? Weeklies seem to have a niche unto themselves, only come out once a week of course and can cost as little as $21/year to subscribe to. Weeklies and small dailies in some markets are extremely monopolistic and local-oriented and still doing well on advertising and circulation fronts. Would you say your comments are aimed more at metro and medium sized dailies? I'd love to anon at 8:16 to get off his high horse for a second to join those of us in the "idiot generation" down here on the ground. Newspapers have been giving people the news they want to read since the dawn of their inception. Even "back in your day" you covered the scandalous news and practiced all manner of yellow journalism to sell papers. It's no different than what you describe today. Just because you may not find some of the news people today want to read interesting or relevant doesn't mean it isn't absolutely necessary to cater to that audience. Without giving the people what they want to read, we might as well pack up our newsrooms and go home now. That's not to say that sort of news is a replacement for serious stories, but they are necessary, just as reaching a younger, more digitally-connected audience is necessary. The longer we tell young people to stay off our lawns, the fewer we'll be able to lure in when/if they are interested older readers. Just a side note on the calculations, and not the overall conclusion--I certainly hope that the lifespan of today's 50 year olds will go beyond 2040. The lifespan information that you cited is based on those born now, not those who are already 50, or 60 or whatever. Those people have already survived the infant mortality, childhood diseases, etc. that are build into the overall lifespan numbers. Average lifespan is greater for a 50 year old (think of it this way--someone who is already 85 does not have a negative lifespan). That said, the overall conclusion that the upcoming generations are not as print-centric is still valid, and if the 2040 number is 55 million instead of 44 million, that is still a big drop. I'm in agreement with James above regarding 'how long will advertisers support local papers?'. Re: Local Advertising - Even the smallest of businesses today has a wide variety of alternative, effective advertising options on the local level. That's crushing newspapers' local revenue much faster then they expected. Re: National Advertising - Some papers hope that national advertisers will adopt local strategies and drive revenue boosts. That's advertising from companies like Microsofts, HPs, Ciscos, ATTs and Verizons, etc. (which have carried some newspapers for a couple of decades now). The problem is these companies sell the very communications products that are driving people off the print product they are reading. It's sort of a dance with the devil that newspapers have no choice but to do. That will continue and it will accelerate the projected decline. This analysis assumes that people keep going with their buying habits. Two my grandmothers used to subscribe to a newspaper for years. Both stopped subscribing. There is no doubt that reading habits of the population are changing. But I think these projections may be based on a faulty premise and incomplete sample data. I can recall seeing studies on newspaper readership, over the years, that suggested the same thing: that older age groups tend to read newspapers more frequently. It's really nothing new. Younger folks simply don't read newspapers, but their reading habits change over time, as they mature and understand the necessity for becoming better informed. I've experienced efforts at more than one newspaper to try and appeal to younger demographics, and I've always thought it was folly. Those efforts usually only succeeded at ticking off the core readers, and the targeted audience STILL didn't care. So these projections don't take into account how reading reading habits change over time. People who say they don't consider newspapers as a main source of information when they are 25 tend to change their minds by the time they're 50. Of course, that is anecdotal, base on my own experiences of talking to readers and other personal observations. I don't think you can come up with a more realistic project without comparing recent studies to numerous past ones. Only then can you understand trends, especially among the older generations who tend to be core readers. Like others have said, the true concern is the changes in the habits of traditional core readers. And I think the exodus from print to the internet really does have something to do with the quality of the print product, although it's clearly a much more complex issue than that. I think the most important question to ask is what kind of printed product future generations will read. If they remain as they are (feeble efforts by completely gutted news staffs), they probably don't have a future. Printed newspapers still do some things better than other mediums - presentation of long form journalism, impactful presentation of graphics and photographs, etc. Part of the problem is that high quality, meaningful print products that people actually want to read will never have the capacity for massive short-term profitability as mediocre, low-cost efforts did before the rise of the internet. Quality costs. But if anyone ever wants to recommit to quality, those kinds of publications might have a longer life because the public is already tiring of what they are presently getting. The more publishers cut their print products, the faster the readers abandon them. Commitment to readers is what's lacking, and they know that. Why should they stick around? Someone thinks there will be a population of newspaper readers in 2040?? Strike up the band! That's the rosiest prediction I've heard in a long time. But seriously, get real. The industry circ fell about 10 percent last year, but it was 20-plus percent at several regional metros (S.F., Newark, Dallas, Atlanta etc etc.) If those papers don't pull off some last minute heroics this year and next, they won't make it halway through this decade, let alone to 2040. 1. If you accept the premise that a physically printed newspaper is providing yesterday's headlines, then you may have to concede that the future is bleak for the business; especially if that tail continues to wag the media dog throughout the immediate future. 2. If you believe that flexible displays (like the one LG showed off recently) and better-designed eReaders will replace paper in this space, then the product doesn't need to go away. News is still valuable. Our methods of delivery need changing. 3. Format aside, the real question is the content being published. Ultimately good content wins readers. I think the question for dailies revolves around what will be in their publications in the future. And this, of course, depends on the medium through which they distribute their content. If it's print, I believe the papers need to enrich their depth (a la NY Times) and if it's for flexible digital media, I think the content needs to be more customizable for the reader. The industry can save itself in my view. There is no death knell for good journalism. To the contrary, I think the proliferation of blogs, iReporters and similar tripe (intellectually valuable blogs aside, Alan) only creates the background noise needed for good editorial to distinguish itself. The masses are voting with their actions. They want more news, faster - and they want it delivered instantly (meaning online) as opposed to waiting for their favorite newspaper to go to print.